Soft pretzel kids cooking party. Having a soft pretzel kids cooking party allows kids to get a hands on cooking experience. Kids are sure to love the fun, the mess and eating the finished product. Create one copy of the recipe below, one for each child. This will give them each a chance to follow the recipe while they are preparing the menu. It is also a good idea to include an extra one for them to take home so they can impress their own family with what they learned at the cooking party. Once you know the number of children coming go through the list of things needed especially utensils, bowls, etc. If you need extra ask friends or family if you can borrow some items for your pretzel kids cooking party. If you have a large group of kids split the group into two teams and double the recipe. Work together as a team and assign different tasks to each child so everyone has a turn adding or stirring. Pour water in measuring cup and heat water in the microwave to lukewarm, about 110 degrees. Add sugar to water and stir to dissolve. Add yeast into water. Allow yeast to bubble and foam for several minutes. Meanwhile in mixing bowl add salt, soft butter, 2 eggs and 3-4 cups flour. Blend together. Add in yeast mixture and remaining cups of flour. Blend until dough forms a ball. Knead on a floured surface several minutes. Pull off pieces of dough and roll into ropes. 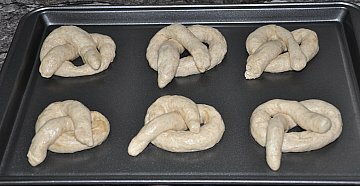 Then cross ends over to make an X and form dough into a pretzel shape. Place on greased cookie sheets. In small bowl whisk egg white. With a pastry brush, brush tops of pretzels. Bake at 400 degrees for 12-15 minutes until golden brown. While waiting for pretzels to cook, prepare a dessert or other recipe you have planned, decorate aprons, chef hats or play games. Back to another children's party idea from Pretzel Kids cooking party.